The SCADA system at Western Municipal Water District’s Southern California waste water plant was no longer sufficient for their needs, so they asked Trimax Systems, Inc., to implement a new solution. As a well-respected systems integration company, California-based Trimax takes pride in offering great integration services coupled with exceptional value to their customers. When Western Municipal approached Trimax Systems, they requested that Trimax look into Ignition as a possible SCADA solution. According to Trimax’s former director of operations who worked on the Western Municipal project, the management of the water district asked Trimax to make a detailed comparison between Ignition and Wonderware, which was the SCADA software that Trimax normally used. At the time, no one at Trimax was familiar with Ignition and they doubted it would work better than their usual SCADA software. Trimax ran a 14-point, side-by-side comparison of the most important features of a good SCADA system, including cost, capabilities, and compliance with modern IT standards. After Trimax finished its comparison, they were surprised to find that Ignition was the clear winner. The Trimax team realized that they should use Ignition for the Western Municipal project and all of their other projects. After Trimax evaluated and recommended Ignition, Western Municipal was convinced that they had found the right solution to their SCADA troubles. Armed with Ignition, Trimax began solving problems at one of the wastewater plants located in the district. Western Municipal was seeking a new system that had the ability to display multiple, full-featured SCADA clients on different devices such as computer workstations, mobile devices, and operator interface terminals (OITs). The OITs were located in the field, so the ability to have remote access to devices was a vitally important requirement for the new SCADA system. A unified SCADA system for all their facilities was also highly desired, so the solution needed to be powerful and flexible enough to become a new standard across the entire district. This was a tall order – and Western Municipal entrusted it to Trimax. 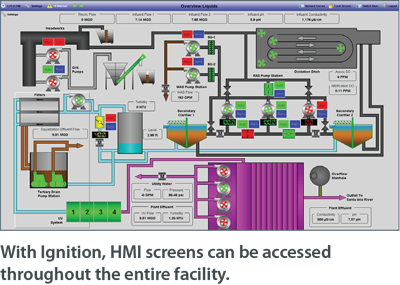 One major pain point of the plant’s old SCADA system was the limitation on where, how, and by whom SCADA screens could be accessed. This was especially problematic in the case of certain control panels, according to Trimax’s former director of operations. Before Trimax replaced the old system with Ignition, the only way to check on the control panel was to have someone physically go and look at the control panel’s OIT, and then that person had to use the radio to tell someone else what was happening. Once Ignition was in place, that entire process changed. Ignition doesn’t put restrictions on how many people can be given access to the SCADA system. Ignition’s web-based architecture allows unlimited clients to be launched on any device equipped with a web browser; plant employees can view SCADA screens where and how they want. Trimax put new IPCs (industrial personal computers) as panel views all around the plant, so now, by using Ignition, workers can access the system from desktops, on the plant floor, or on their mobile devices. In the plant’s old SCADA system, the control panel OITs had limited visibility and functionality because they ran a very basic software application that was native to the OITs. It was important for the new system to have the ability to display full-featured SCADA screens at the control panels, as well as at multiple other locations across the plant. Thanks to Ignition’s open, server-centric architecture, this was not only possible but was also simple to do. Once Ignition is installed on one server, clients can be instantly deployed without limit. This allowed Trimax to create a SCADA project in one place and share it all around the plant. With Ignition, the team at Western Municipal can view the exact same screens anywhere throughout the plant and remotely. By having visibility to the whole system, they can see and control the system for the entire plant from any location. Ignition also reduces the time spent on project development because they can create one project for the entire plant and when they need to make changes, they can make changes in one place and it updates throughout the project. At different sites across Western Municipal Water District, a mish-mash of different SCADA programs were being employed, ranging from well-established systems to small, proprietary, custom-built applications. The combination of these systems was downright confusing and as a result the communication between different sites was much less than optimal. Ignition was used to cut through the confusion and get the entire plant on the same system. Ignition’s cross-platform compatibility allows Ignition to run equally well on any operating system, including Windows®, Mac, or Linux. This flexibility made Ignition a perfect solution to unify the various systems at the waste water plant and beyond. Trimax’s former director of operations explained that it was a very important priority to Western Municipal that the new SCADA solution be a unified system. Trimax devoted a large part of its work on the project to forming a plan to standardize the SCADA system across the entire district for years to come. The new system not only had to work at the first plant, but also needed the flexibility to work at all the plants in the district. Ignition was instrumental to carrying out this plan successfully. Thanks to the expertise of Trimax Systems, Inc. and the power of Ignition, Western Municipal Water District now has the SCADA system it needed and a solid plan to move forward. After Ignition was installed at the first facility, the water district expanded the use of Ignition to two other facilities and moved forward with a plan to make Ignition the SCADA standard across the district. Trimax Systems also has a bright future with Ignition. Since the completion of this project, they have done multiple projects with Ignition and have become certified by Inductive Automation as an Ignition Premier Integrator.